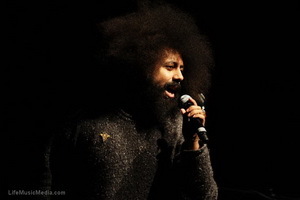 Reggie Watts has been selling out shows across the globe, including smash hit runs at Joe’s Pub in New York City and at Brian Eno’s Luminous Festival and tours with Devo and Regina Spektor. He regularly performs at festivals around the world including Montreal’s Just for Laughs Comedy Festival, Seattle’s Sasquatch Music Festival, Bonnaroo, SXSW, the Edinburgh Comedy Festival, the Sydney Festival, and the Capetown Comedy Festival. Hilarious, brilliant, unpredictable, Reggie Watts is a staple of the international performance scene. Reggie’s improvised musical sets are created on-the-spot using only his formidable voice and a looping machine. An avowed “disinformationist”. You may not know what Reggie is going to do, but that’s okay – he doesn’t either. Watts’ is a show definitely not to be missed by comedy or music fans alike.